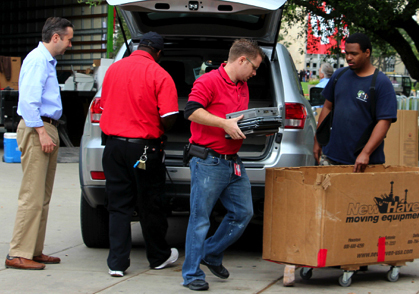 University of Houston students, faculty and staff who don’t know what to do with their old unused electronics can drop them off at the Office of Sustainability’s upcoming electronics recycling drive. The popular annual event, now in its fourth year, will take place Friday, March 9, from 8 a.m. to 1 p.m. in the Student Center South Circle Drive. Members of the UH community who plan to donate items are asked to go online and print out a flyer to place inside their vehicle’s windshields that will let traffic control volunteers know they are there to drop off electronics equipment. Once again, the Office of Sustainability is partnering with Bass Computer Recycling to put on the drive. A full list of items and materials that Bass Recycling will accept is available online. In addition, University of Houston-owned property will not be accepted. All of the electronics equipment that is donated by the UH community will be processed by Bass Computer Recycling, an R-2 certified recycler with more than 25 years of experience. Bass will clean, test and refurbish the equipment for resale. Items that cannot be refurbished will be deconstructed and recycled.